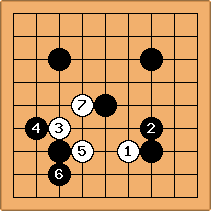 Base level of Igowin for new player is set at 25Kyu. 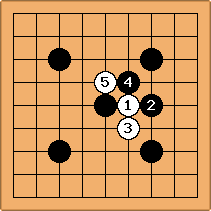 Note that the difficulty levels indicated by Igowin have poor relation to common ranks. It's believed that Igowin's "average rank" (under "statistics" menu) indicator is typically elevated by about 8-15 ranks compared to its real-life rank. For more details see RankAsGivenByIgowin article. You can get it free at David Fotland's page: http://www.smart-games.com/igowin.html. Igowin (for iOS) is also a new program for the iPhone, iPad and iPod touch. This uses the full strength of the Many Faces of Go engine vers.12, as of 2009. It plays even games from 22 kyu to 2 dan. The version for the iPad has been released with 9x9, 13x13 and 19x19 boards. JanDeWit: It has the standard Way to Go tutorial, it plays only on 9x9 and you can only crank up the difficulty by getting better yourself (after studying a little bit I rocketed up from around 23kyu with 4/5 handicap to 12 kyu with no handicap, so I guess I'm getting better). The marked points are considered dame by Igowin during the counting. Igowin also doesn't recognise seki. 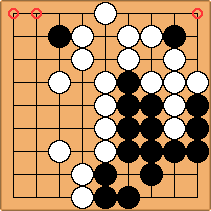 It thinks the marked black group is dead (white's turn). What do you think? Aloril: Its unconditionally alive, no matter what white does black can just pass and white still can't capture it. year (7K): I've had igowin record death for itself in a similar shape. The second eye point was above it though rather than to the left. I think it must be looking at the white at the critical point in the four point nakade rather than the second eye. 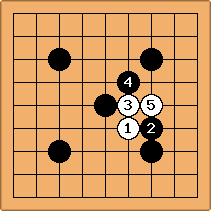 Igowin does have a "dispute score" function, where you can continue to play through positions like this to convince it that you are right. What is your high score in this program. Mine is 2 Dan +0.50 with 4 Dan as the most common and 6 Dan as the best rank after only 188 games. DrStraw This is probably not a very interesting question as it is easy to get lucky one time and get a high rank. More interesting would be the highest average rank attained after a sizable number of games, say 100. So you are saying that 188 is a lot more than 100? I could play 12 games more, and then give you the average at 200 games. But that would still be around 2 Dan + 0.50. Jugular: I've managed to find a new and difficult Igowin challenge (a sign of a boring job I reckon). See if you can get there quicker! It is not clear whether you are claiming that you achieved this or whether you are throwing it out as a challenge. Bildstein: From memory, it doesn't start keeping averages until you lose a game (stops all those kyu games muddying the waters). So if you win all the way to pro and then lose, I suppose this would happen. The above challenge can be beaten in 11 games at the quickest. This is possible through vicious bug exploitation, and thereby defeating the computer by nearly 100 points every game. 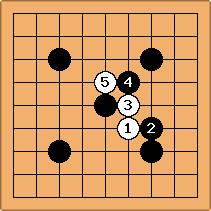 The Bug: after Igowin tallies the score for a game, don't start a new game or dispute the score. Instead, click on the board. You can place pieces for BOTH sides, allowing you to set up a devastating loss for the computer. Click "pass" twice when you are done rigging the board to receive your new score. This bug exists in the Igowin demo (version 1.0), linked for download at the top of the page. I cut off the lower right but Black invests in it and makes it big enough that when I capture it there's not much more to do to win. Sometimes I break in to the bottom left, sometimes the top right, and sometimes I invade the top left for six-stone, two point life.